Instagram Growth Strategy with Child Accounts to Get Real, Engaging and Targeted Followers. Discussion in 'Social Media' started by David Restrepo, Mar 28, 2019. For the review, @David Restrepo provided the service for about 18 or 19 days. David was super easy to work with on this and flexible when it came to the BST requirements without any issue. The account we used for the review had no business getting the amount of followers it received. It has little content and is not active at all. I did a cursory review of the followers and all of them I checked appeared legit so I'm comfortable that this is the real dea. This is a quality service from someone who respects how things are done on BHW. He and I had some uncomfortable commentary when he first came aboard due to some rules issues but he has always been respectful of the staff and the forum. Good guy, someone I would do business with in the future. Account started with less than 100 followers 18 - 19 days ago. Wouldn't want to recommend David because I don't want to share this precious jewel with others! But the truth is, he is extremely easy to work with, flexible with the targeting, transparent and provides great results. My results for a small acc started coming in just a week ago and they are great. David is the man. I joined BHW a couple months for one reason: to find someone that can do the Instagram fan page method. After being screwed over from someone I found in a Facebook group and trying to do the method myself, I knew I had to find someone. The work, skill, and patience required to do this method is NOT easy. It took me roughly 5-6 weeks to get setup and in the first 3 weeks I bugged the crap out of David by asking him a lot of questions and updates on my account. Fast forward to today and the growth I have been getting is insane. I am a rapper so engagement is HUGE for me. I've never received so many story views, comments, and DM's in my life. The one con is that I have received a couple of followers from Africa which I don't mind, but I live in America and the audience is big for me. David is currently trying to find ways to exclude followers from here. At first I thought it was impossible to build a personal brand from nothing and he proved me wrong. If you have any questions from my experience with David, please let me know. 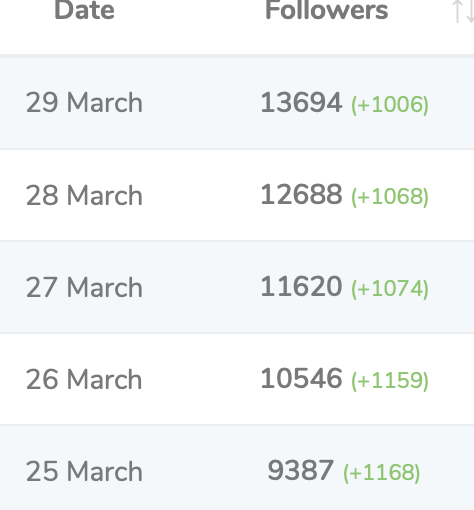 I'm currently gaining ~800 followers/day. OP, How much to you teach me? I think I already got how the method works, I am not going to compete or be in the same niche as you. You don't offer any packages below 50 accounts? @BassTrackerBoats, how many child accounts was your review? I don't see it stated there but in assuming it's the largest package? I have a 9k female travel account. If I get 50acc what’s the estimated growth per month? It is always the largest package per the rules. Largest package says 250+ so more specifically I wasn't sure if it was 250 or more than 250 child accounts. Trying to gauge the packages as well as whether 250 would give the same results. Thanks! Do you have less than 50 account package ? Count me in for Review copy if available or any early bird discount. Also, can i see one or two child account ? Please pm me. Hey so you will be creating and managing the child accounts with some sorta bot? Also will i have access to the child accounts? Highly interested in this service, But I have few concerns. 1. Can you do something like white-labeling? My clients always wants to see the server, jarvee or child accounts.. They need to make sure that I am not outsourcing the stuff. 2. Do you have any experience of growing GEO based accounts? 3. PM me sample child account if you can. 4. I know prices are really very reasonable but again if you can offer discount code it would be highly beneficial for me. 5. Also, who will own those child accounts? After working with @David Restrepo for a couple of months all I can say is that the service is amazing. I have around 1,500 accounts with him and every single one works like a charm. The child account method is the best one if you want to grow your Instagram account. It takes a few weeks until everything is up and running, but the wait is worthy. I don't know for how long the method is going to work, hopefully for a long time, but I'm going all in with it and probably you should too. Contacted you on skype. Would be extremely interested in some more in depth information about expected growth etc etc for my personal acc. The first person I found that offered this service was @proxified. Unfortunately as we all know, there is a long waiting list and I wanted this to be done right away. I did my research and saw how active David was in any post related to this method and I honestly took my chances. I didn't know what to expect because I was screwed over before and I'm not patient at all. I ended up taking my chances and he sent me an invoice. Do you mind me asking which package you are using? Sent you a message on WhatsApp! Thank you so much for the excellent review!! Amount of child accounts here: 50 child accounts. Thank you very much for this review! I believe this was already answered, but for anyone interested. 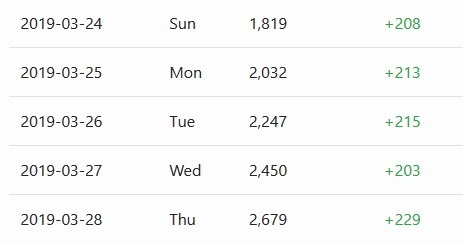 Amount of child accounts here(800-900 DAILY followers) = 250 child accounts. Sorry. I don't provide that service. No. The minimum is 50 child accounts. Amount of child accounts for the review: 250 child accounts. Yes. 250 child accounts used for the results. I've attached an image with results above. No. Minimum is 50 child accounts. I've PMed you. Yes. I'll be creating accounts from zero based on main account details. With no-spamming names. Later, I'll handle them for you on a monthly basis. No, I don't provide access to child accounts. 1. No, I don't offer white-labelling services. And for that, we can figure out something for providing trust to your clients. 4. Prices are already discounted. They will rise soon! 5. I will. We can get an agreement for selling them after 10 months or so working together. I've already answered to you there. I've already answered you there. What is included in the price? Just the account or url, link/handle in bio, dm, tag etc?